A fun look back at one of the most dysfunctional bands of the '80s. You know your band's financial situation is spiraling out of control when you find yourself giving a video director 20 grand to shut down New Orleans' French Quarter so he can film you walking down the street, and the only footage that makes the final cut is two seconds of your boots onscreen. Mötley Crüe might have written the book on '80s metal excess, but many other bands from the era lived the exact same lifestyle, and some might argue, went even further with the Dionysian decadence that defined the decade. The resulting career flame-outs in the early-'90s were as sudden as they were devastating, but each musician will tell you the ride was totally worth it. Of all the bands from the Los Angeles pop metal scene of the early '80s, the one with the strongest pedigree was Dokken, arguably the finest singles band of the pop metal era. Lead singer Don Dokken was older than the majority of the hairsprayed kids at the time, and brought a '70s hard rock sensibility to the heavy sound, placing strong emphasis on vocal melodies. Guitarist George Lynch was one of the most revered shredders of the decade, bassist Jeff Pilson was an excellent harmony vocalist, and drummer Mick Brown provided a powerful bottom end. All the pieces to the puzzle were there save for one: they had the talent, the songwriting ability, two of the savviest managers in the business (the same team that handled Metallica and Def Leppard), major label hype, heavy rotation on MTV, and a devoted fanbase, but in the end, the band's lack of chemistry killed them. Prior to their acrimonious 1989 break-up, while they didn't pack the arenas like Crüe, Ratt, or Bon Jovi did, they still had the kind of fame other bands would kill for, releasing a string of platinum albums and selling millions worldwide. In fact, if you stack up Dokken's '80s albums and singles against Motley Crue's, Dokken's are actually the most consistent, but along with the fact that they could never get along, what plagued this band from the very beginning was the lack of foresight when it came to the music video medium. Crüe effortlessly captured lightning in a bottle; Dokken was always scrambling to chase it down. While nearly every one of Crüe's videos became essential nuggets of '80s pop culture, Dokken's were often spectacularly awful, and often hilariously tacky. It wasn't for lack of trying, though. Managers Cliff Burnstein and Peter Mensch were fully aware of the burgeoning home video trend, and in 1986 they had the band put together the hastily-assembled, but very successful VHS Unchain the Night, featuring all the band's videos at the time as well as some surprisingly raw footage shot by a very road-weary band. Now more than 20 years later, Rhino has reissued it on DVD in expanded form, and most surprisingly, it turns out to be one of the most entertaining music DVDs this writer has seen in a while. Listing the goofy moments in Dokken's video history is like a lesson in how not to make a music video. You've got the band performing between two gigantic green Styrofoam hands while a helicopter buzzes above them on the clip for "Into the Fire". There's the primitive green screen technology that mars both "Just Got Lucky" and "In My Dreams". "The Hunter" is a conceptual piece run amok, from Dokken's self-indulgent Harley-riding to Pilson being lynched by rednecks posing as the PMRC. Lynch's guitar comes alive in a horrific bit of claymation during "Burning Like a Flame". A comely young Patricia Arquette is saved from Freddy Kreuger by Dokken's "Dream Warriors". Dokken sports the hairstyle from hell on the clip for "Walk Away", and as mentioned earlier, there's that $20,000 shot of Dokken's boots on "Heaven Sent". Of course, no metal music video can quite compare to the campy "Breaking the Chains", a video the band had long regretted, and to their credit, they joke heartily about to this day. It runs the gamut, from Lynch busting from his shackles (he's "breaking the chains", get it?) and rescuing his similarly-bound bandmates with his metal guitar poses, to an uproarious shot of the director's girlfriend mouthing the lyrics (Don: "Says she loves me." Girl: [mouthing] "I love you." Don: "She'll come back." Girl: [mouthing] "I'll come back. 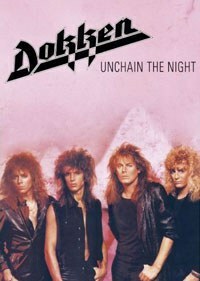 "), to the most ridiculous scene of them all, Dokken chained to a bed wearing a disturbingly low-cut kimono while the rest of the band plays around him. Introducing the clip, Pilson says that the first thing he did upon joining the band was film the video, and as soon as he saw the final product, he contemplated quitting. Still, for all the cheesy special effects and ham-fisted concepts, the songs hold our attention, every one of them taut hard rockers with insanely catchy choruses and often brilliant guitar work by Lynch (I've long contended that his solo in "In My Dreams" is one of the finest guitar solo of the '80s pop metal era). On one occasion, though, they got it right, on the video for the classic power ballad "Alone Again". Directed by Wayne Isham, it's the first power ballad video to employ one of the great video gimmicks of the '80s: the iconic slow-motion live footage. The live clips are from when the band was opening for bigger acts, but the editing makes them look like rock gods, striking poses, sweating, engaging the crowd, doing their damndest to please us, and they do so, as the shots of euphoric fans tell us. Such a tactic would be used by Isham and other directors in the years to come (from Mötley Crüe, to Bon Jovi, to Poison, to Warrant), but it was this clip that set the standard, the perfect accompaniment to an admittedly gorgeous song. After the great tunes and unintentional laughs, we're treated to a bonus half hour interview with Dokken and Brown, who fess up to the band's career-damaging internal strife (Dokken openly admits he hated Lynch all those years), but best of all, the duo regales us with many side-splitting tales of debauchery and excess, from parties with unsuspecting young women on tour buses ("Where are we going?" "Chicago." "But we just left Austin.") to how a 30-minute recording session between Pilson and Brown turned into a three-day cocaine-and-pizza binge. Dokken and Brown know they had the world in the palm of their hands and blew it, but they way they laugh at their own mistakes and look back at all the madness of being a huge rock band, and how proud they still are of the music they did create, hammers home the DVD's charm. It looks back to a time when rock stars acted like rock stars, when hooks mattered, when the record industry was hemorrhaging money, when hard rock was all about fun and not moping about how sad the Seattle winters made you. Buy the DVD and have your air guitar ready.